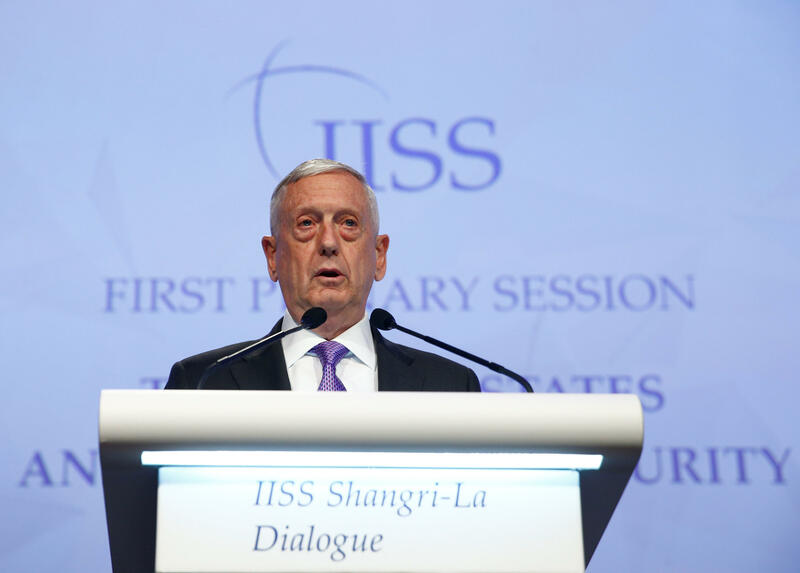 SINGAPORE -- U.S. Defense Secretary Jim Mattis turned up the heat on North Korea and its main benefactor, China, on Saturday, calling the North Koreans a "clear and present danger" and chastising the Chinese for coercive behavior in the South China Sea. His sharp words for both countries suggest he believes China will, out of self-interest, exert leverage on North Korea to halt its nuclear and missile programs even as Washington pushes Beijing to change course in the South China Sea. Speaking at an international security conference in Singapore, Mattis said the Trump administration is encouraged by China's renewed commitment to working with the U.S. and others to rid North Korea of its nuclear weapons. He also said he thinks China ultimately will see it as a liability rather than an asset. China blocked tough new sanctions against North Korea that the United States pushed in the U.N. Security Council on Friday. However, the Security Council did vote unanimously to add 15 individuals and four entities linked to the North's nuclear and missile programs to a U.N. sanctions blacklist. In his speech to the Shangri-La Dialogue, sponsored by the International Institute for Strategic Studies, Mattis sought to balance his hopeful comments on China with sharp criticism of what he called Beijing's disregard for international law by its "indisputable militarization" of artificial islands in disputed areas of the South China Sea. "We oppose countries militarizing artificial islands and enforcing excessive maritime claims unsupported by international law," he said. "We cannot and will not accept unilateral, coercive changes to the status quo." In an interview on CBS News' "Face the Nation" on Sunday, Mattis told host John Dickerson that "a conflict in North Korea ... would be probably the worst kind of fighting in most people's lifetimes." Rep. Mac Thornberry, a Republican from Texas and chairman of the House Armed Services Committee, told a news conference later that he believed Mattis had effectively stressed the U.S. commitment to allies in the Asia-Pacific region. "He was very clear, very strong," said Thornberry, who led a bipartisan congressional delegation on an Asia tour and attended Saturday's Singapore conference. Overall, Mattis' speech struck a positive, hopeful tone for cooperation and peace in the Asia-Pacific region, where he and his predecessors have made it a priority to nurture and strengthen alliances and partnerships. "While competition between the U.S. and China, the world's two largest economies, is bound to occur, conflict is not inevitable," he said. "Our two countries can and do cooperate for mutual benefit. We will pledge to work closely with China where we share common cause." He was, however, unrelentingly critical of North Korea, a politically and economically isolated nation whose leaders have long viewed the United States as a military threat, in part because of periodic U.S. military exercises with South Korea, which the North sees as preparations for attacks aimed at destroying its ruling elite. He called North Korea an "urgent military threat." In a question-and-answer session with his audience of national security experts from across the globe, Mattis was asked whether the U.S. might attack the North pre-emptively and without warning South Korea in advance. "We're working diplomatically, economically, we're trying to exhaust all possible alternatives to avert this race for a nuclear weapon in violation of ... the United Nations' restrictions on North Korea's activities," he said. "We want to stop this. We consider it urgent," he added. The U.S. has about 28,500 troops permanently based in South Korea, a defense treaty ally. "North Korea's continued pursuit of nuclear weapons and the means to deliver them is not new," Mattis said in his prepared remarks. "But the regime has increased the pace and scope of its efforts," he added, alluding to the North's series of nuclear device tests in recent years and an accelerated pace of missile tests seemingly aimed at building a rocket with enough range to hit the U.S.
"While the North Korean regime has a long record of murder of diplomats, of kidnapping, killing of sailors and criminal activity, its nuclear weapons program is maturing as a threat to all," Mattis said. "As a matter of national security, the United States regards the threat from North Korea as a clear and present danger." Mattis made no mention of President Donald Trump's decision to pull the U.S. out of the Paris climate change agreement. The issue arose briefly during questions from his audience, but Mattis did not address it directly. An Australian questioner asked, in light of Mr. Trump's abandonment of an international trade deal known as the Trans-Pacific Partnership, and his withdrawal from the Paris climate deal, "why should we not fret that we are present at the destruction of" a global rules-based order? "There's going to be fresh approaches taken" to various issues by Mr. Trump, Mattis said, while making it clear that he personally believes the U.S. needs to avoid isolationist tendencies. "Like it or not, we're part of the world," he said.